What I love most about nimbus theatre (other than the fact that they perform at the Crane in Northeast, a 15 minute drive from my house) is that they usually perform new works, often historical, always interesting and thoughtful. 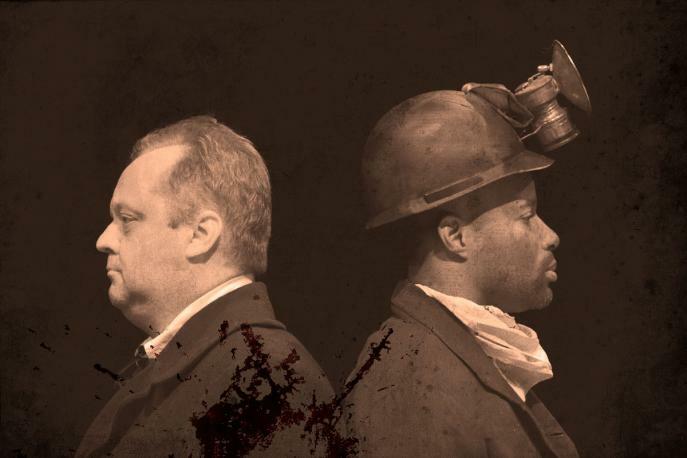 Their latest creation is Ludlow, about the Colorado Coalfield War of 1913-1914, the deadliest labor dispute in US History, resulting in the deaths of dozens or even hundreds of people. Playwright Josh Cragun and director Liz Neerland, Co-Artistic Directors of nimbus, have created an ambitious new work with a large and talented ensemble that not only brings the lives of the victims and survivors to life, but also speaks to current issues of unions, immigration, and the haves vs. the have-nots. I've only recently heard of Ludlow while reading the fascinating biography Molly Brown: Unraveling the Myth after a visit to Denver (and her house) last year. A few years after her Titanic fame, Margaret (she was never called Molly in her lifetime) worked to raise awareness and money for the miners and the victims and survivors of the violence. The tragedy that happened in the town of Ludlow was the most horrific incident in over a year of violence in the coal mines outside of Denver. The play introduces us to the diverse residents of the tent city in Ludlow (having been kicked out of the company-owned housing when the workers went on strike), including Greek strike leader Louis Tikas, African American miner Joe, the Latinx Valdez family, the Italian Petruccis, and a Japanese man working to make money for his family back in Japan. They all join together to demand fair wages and treatment from the coal companies, and are even visited by famed union organizer Mother Jones. But despite their strength and determination, we know it's not going to end well for them, and watching the tragedy unfold after we've gotten to know these people is devastating. Everyone in the ensemble is very believable in their role(s), from the adorable young actors Anika Sage and Marcelo Mena as the children of the camp, to Brian O'Neal and David Tufford in dual roles as the bad guys (company execs and guards), and the rest of the ensemble playing strikers and their families (Kayla Hambek, Meri Golden, Nicholas Nelson, Pedro Juan Fonseca, Richard D. Woods, Siri Hammond, Stephanie Ruas, Tara Lucchino, and Tim Komatsu). It's an all-around strong ensemble that works well together to create the world of the play. As a new work, the play could would use another round of revision and tightening, it feels a bit slow and lacking in momentum in parts. But it picks up in the second act, and the ending is quite effective. And as always at nimbus, it's a well-researched and thought-provoking look at little known but important part of our history (continuing through November 19, including a pay-what-you-can night on Monday November 13).